Do you know what happens in a makerspace? 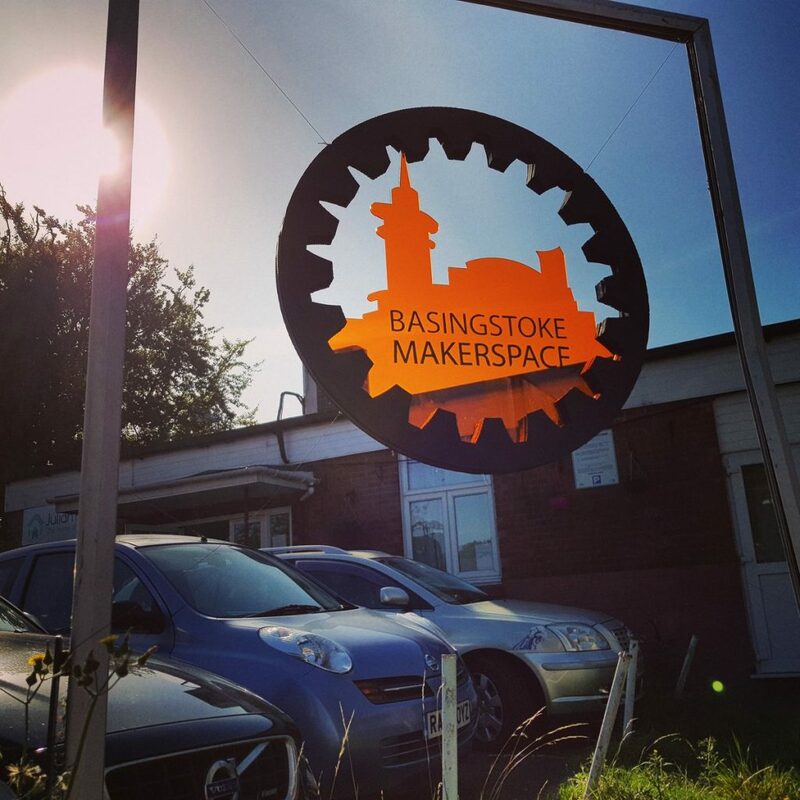 Drop in to Basingstoke Makerspace on any Tuesday evening to find out. At a recent Tuesday Open Evening. one individual was making a three-foot long dinosaur skeleton using a 3D printer. At the same time another was demonstrating how to use a wood lathe to create a wooden bowl. A group of people at one table discussed how artificial Intelligence could be used in the home, while others were busy creating jewellery at a nearby table. Some just enjoyed the free tea and coffee and watched as others tried out a pen that creates 3D.objects. 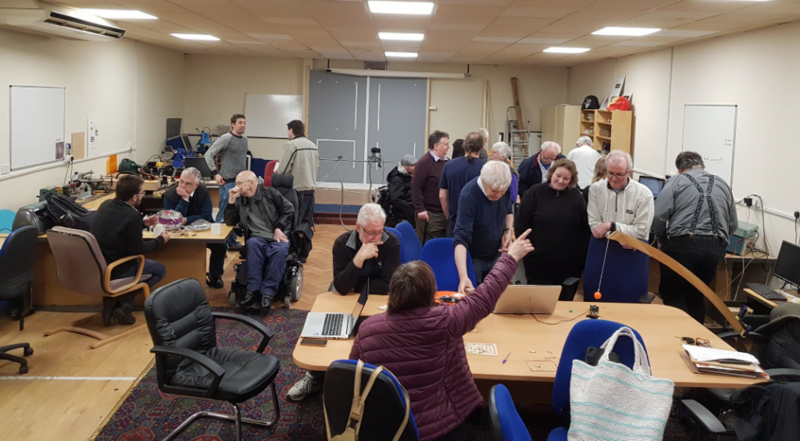 All in all, a fairly typical evening at the Makerspace! You can find us every Tuesday at Maritime House, 65 New Rd, Basingstoke RG21 7PW on the opposite side of the road to Majestic Wine in Basingstoke. 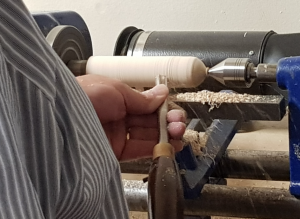 This weekly open evening carried on the theme of wood-turning. Our wood lathe now has a foot safety switch and improved personal protective equipment. A group of us, having been shown basic techniques last week, had a teach-in about the correct tools for specific applications and how to part off a competed object. Like all Tuesday nights many other things were happening. Some people were working on crochet work. Others worked on getting video projectors donated to the makerspace working. Like most weeks members were showing objects that they had 3D printed, including dragons and digital sundials. We completed a project to display the building electricity usage via the internet and updated the X-Carve computer. A dial gauge has also been added to measure bed flatness. Several of us watched a video on the “bCNC g-code sender” that drives the X-carve milling machine. One member expressed interested in milling house numbers from wood (we are planning to do next Monday). Another member discussed how to cast house signs in resin and showed a mould that he had made for the purpose. During discussions there was interest in making life casts of faces so we plan to have a go at this in a couple of weeks’ time. Two members discussed unsolved mysteries including the historical ‘Voynich Manuscript‘ and “On The Trail Of The Golden Owl” . The latter is an armchair treasure hunt for a statuette weighing 33 lbs entirely made of gold and silver, with diamonds on the head. In 1993, the value of the owl was 150,000 euros and it is still unclaimed! A possible funding option for the makerspace? As always at 9:30 we retired to the Maidenhead pub to join “Basingstoke Friends” for a pleasant social end to the evening.